Background: Catheter-associated urinary tract infection produces substantial morbidity in hospitalized patients including discomfort, fever, malaise and unnecessary antibiotic use, which may become an important source of antibiotic resistant organisms. Further, the catheterized urinary tract acts as a reservoir for the dissemination of these drug resistant organisms to other patients. Aim of the study: was to improve the safety of intensive care unit (ICU) patients with urinary catheter via decreasing the incidence of catheter-associated urinary tract infection (CAUTI) at Zagazig University Hospital through assessment of knowledge and practice of ICU staff about catheter associated infection and assessment of the incidence of CAUTI among ICU patients in Zagazig University Hospital and implementation of Infection Control Program in the selected ICUs. 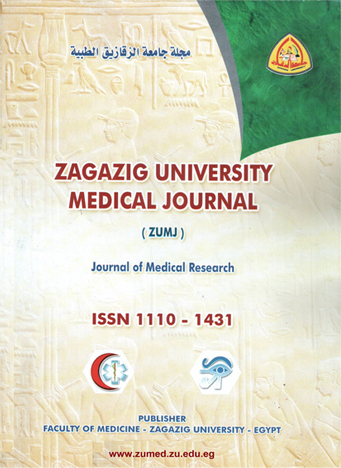 Subjects and methods: An interventional study (one-group pre-test post-test design) was conducted during the period from 2016 to 2018 at Zagazig university Hospital in two ICUs; surgical and emergency intensive care units. The study was carried out through two phases; the first included the followings: active electronic surveillance for (CAUTI); assessment of health care providers' knowledge about CAUTI before and after intervention through constructed questionnaire and assessment of health care providers' practice before and after intervention by using performance observation checklist. The second phase, included implementation of infection control program based on the conceptual model of Comprehensive Unit-based Safety Program (CUSP). Conclusion: At Zagazig university hospitals’ ICUs, implementation of infection control program on CAUTI was noticed to be associated with improvement in healthcare providers’ knowledge and practice and decrease in CAUTI incidence. Sustainability is required to maintain such improvement. So. It is recommended to keep continuous training of ICU staff and upgrade ICU protocols according to recent guidelines.